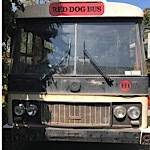 Hi everyone I’m from Denmark Western Australia and recently bought the red dog bus from the movie . It’s a bedford blp2 1978 bus. It’s not registered and I’m trying to research all the laws someone said the best way is to register it as a panel can is this correct ? I have taken out all seats but for 5 ppl. Or do I have to wait till it’s basically completed as a motorhome to register the bus. One last question can anyone help with a service manual at all please happy to buy or pay someone for there time if they could scan one.